Russ Lippitt is back and he's brought hell with him! 'The Showdown, Vol. 2: The Race from Hell' rages down the road again in this supernatural race through the bowels of Hell. Volume two picks up where volume one left off as the coveted prize of escaping Hell lies in the winning of a dangerous and treacherous car race through the circles of Hades. This is an indie comic being funded through Kickstarter so it's raw, uninhibited, and exhilarating. It's a campy exploitation film in comic form and it's relentless. 'The Showdown Vol 2' is a series of clashes between different race teams out to destroy each other to win the race. 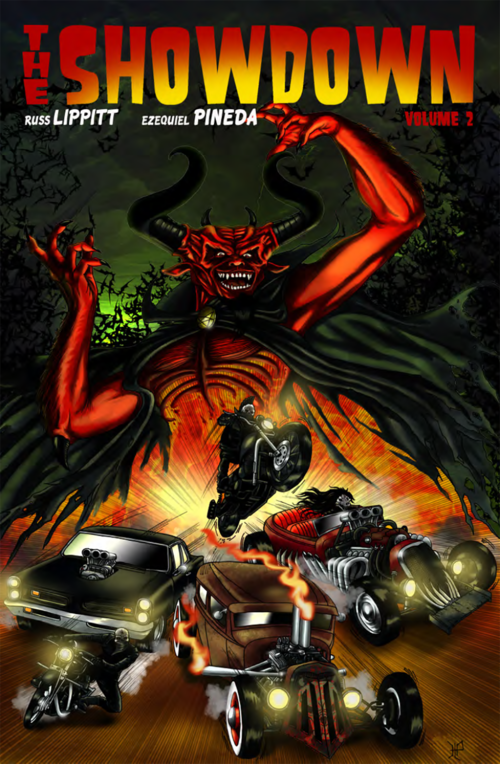 Everything from werewolves, vampires, skinheads, bikers, and other monsters battle one another in souped-up muscle cars, rat rods, and motorcycles. A caption introduces each circle of Hell and the racers involved. It's repetitive but exciting to see how and who does what to whom. Russ Lippitt balances the bloody violence with campy humor and over-the-top action. There are limbs flying off, bodies being run over, decapitations, and consumed by dragons. It's a smorgasbord of horror, dark comedy, and exploitative action thriller. If you're looking for a deeper meaning or some sort of lesson to be learned good luck, this is about having a good time seeing monsters kill each other in new and creative ways amid the bowels of Hell. Ezequiel Pineda takes over art duties from Tony Guaraldi-Brown in this volume and the result is a much more dynamic layout. The character and vehicle designs are unbridled but detailed. The fight choreography can sometimes be muddled but the results are usually a splashy colossal wreck. Nae Esteban provides the deeply saturated colors that feel right in this presumably steaming cauldron of pain and suffering. It's a crazy mix of spectacle and color that fills the page attacking your eyeballs with the wildest action you've seen since Death Race 3000. 'The Showdown Vol. 2' dwindles the field in half by the end of it setting-up the next volume. This should lead to tighter character arcs and more focused fury. Nonetheless, this fun unrelenting race is the perfect concoction for Halloween with monsters, zombies, and killer clowns all out to lay waste to each other. It's a blast especially for this time of year. As legend has it, monsters such as Vampires, Werewolves, and Zombies once roamed the face of the earth but were banished to Hell for their unspeakable acts on humanity. Now in the depths of Dante’s vision of Hell, Satan holds a race once a millennium, a race unknown to man called The Showdown. Creatures from all walks of existence challenge one another in this death match exhibition of fantastic horror and campy grindhouse.